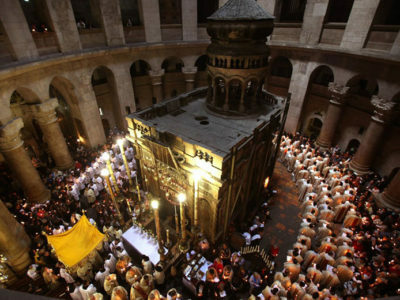 In 2020 Eastern Orthodox Easter and western Easter will be one week apart, affording the remarkable opportunity to experience two very different Holy Weeks and Easters back-to-back in Jerusalem. It will include a three-day excursion to Galilee as well. This pilgrimage will begin on Western Good Friday, and will celebrate the Easter Vigil and Easter Day in the Western tradition at the Greek Catholic Cathedral, the Roman Catholic Church of St. Anne and the Anglican Cathedral of St. George the Martyr. Western Easter Day is Orthodox Palm Sunday as well, which will begin a week of visiting the Eastern Orthodox and Oriental Orthodox communities as they pray through Holy Week. This course is aimed towards those who may have a particular interest in liturgy, church history, or ecumenical studies, but it will also be geared to first-time visitors in the Holy Land who wish to experience a study pilgrimage with very different parameters from those that traverse the land. Mini-lectures, guest speakers, and special visits to churches not normally seen on St. George’s College courses will supplement the main focus of the course: preparing for, attending and debriefing liturgies in the Greek Orthodox, Ethiopian Orthodox, Coptic, Roman Catholic, Armenian Orthodox and Anglican traditions. Students will be encouraged to become more acquainted with these ancient traditions on their return home by continuing in ecumenical exploration and fellowship. Members of all Christian traditions, including non-Western ones, are most cordially welcome to attend this course.